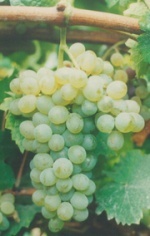 White variety produce aromatic and well-balanced wines. The Verdelho vine generally yields small bunches with notably yellow berries. Verdelho is a native of Portugal, more associated to Madeira Island, where it is used mainly for the production of fortified wunes (White Port and Madeira). Over recent years it has also been used for table wines. It is also cultivated in Azores and, recently has been used to produce Australian wines. The Spanish grape variety Verdejo is similar, but DNA shows it is genetically distinct.